Pixar proof – Winning. Words. 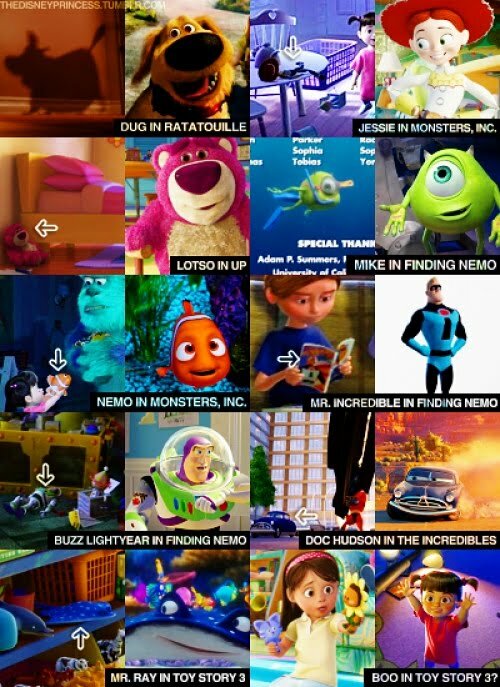 As if we needed further evidence of Pixar’s genius when it comes to movie making. Yet here it is. Thanks to some bright spark on Reddit, here’s a rather nifty pict-o-gram (or shot-o-graph, or still-o-grid) showing where those clever Pixar animators have hidden cameos of beloved characters in their films. Some characters even cameo before they’ve been in a film (as with Lotso in Up). Some you’ll have spotted before, others probably not. Either way, genius. Next Rachel Weisz is a witch!